Bangkok is quite possibly the most exciting, enchanting and enlightening city on earth. With sprawling street markets, magnificent temples and palaces and countless fragrant food stalls to explore you could spend a lifetime in this city and still come back begging for more. Although there is a myriad of adventures to be had in Bangkok there are too innumerable opportunities for exploration outside the city limits. From world famous floating markets to off the beaten track national parks Thailand is waiting to ignite your wanderlust and inspire your passion for travel once more. 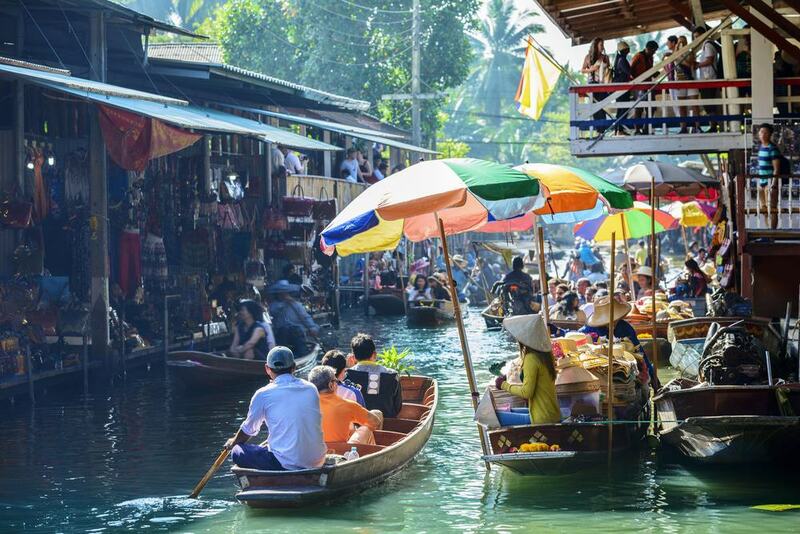 One of the most iconic snap shots of Thailand is of the floating markets. As such, no trip to this magical nation would be complete without spending a day getting to grips with local culture and sampling everything these wondrous markets have to offer. The Damnoen Saduak Floating Market sits in the Ratchaburi Province, just an hour and a half from Bangkok city centre. Throughout the course of a day you can take a long boat down the canal stopping at each of the floating stalls. Be sure to sample local favourites such as Pad Thai and coconut ice cream. 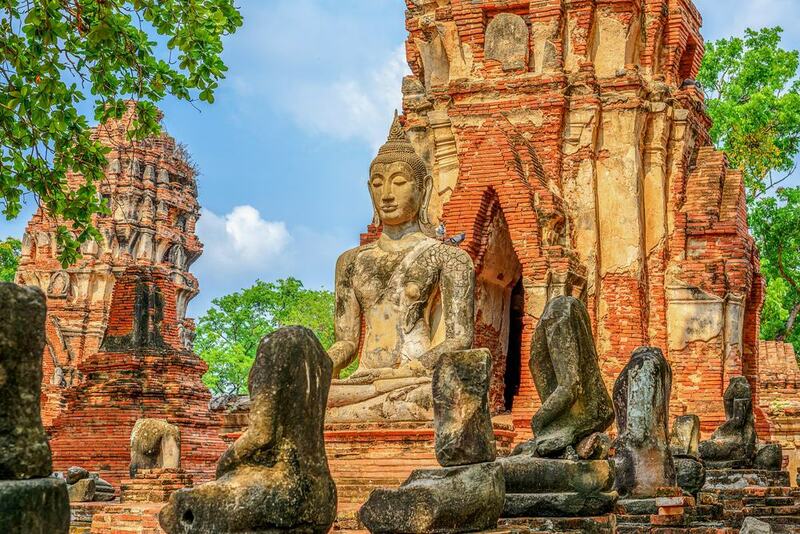 The ancient city of Ayutthaya is the capital of Siam and a simply incredible day trip from Bangkok. The Ayutthaya complex is a certified UNESCO World Heritage Site and rightly so, this gem must be preserved forever more. With dozens of temples to explore be sure to wear comfy shoes and bring a bottle of water. Wat Mahathat, Wat Lokayasutharam and Wat Na Phra Mane are all ruined palaces that give a sense of mystery to the day. What was life like here in ancient times? Don’t miss the photogenic Head of Buddha which sits nestled away in the roots of a tree trunk at Wat Mahathat. Have you heard of the bridge on the River Kwai? Well, you’ll find this word famous historical landmark in Kanchanaburi, 130 km west of Bangkok. A day trip to Kanchanaburi is harrowing and humbling, learning about how the Death Railway was constructed and the thousands of lives that were lost. Take the time to visit the JEATH War Museum to learn more about this tragic point in history and pay respect to the soldiers who perished in the war at the cemetery adjacent to the museum. To this day it is still possible to ride along the Death Railway track and despite the horrid history the view is quite spectacular. 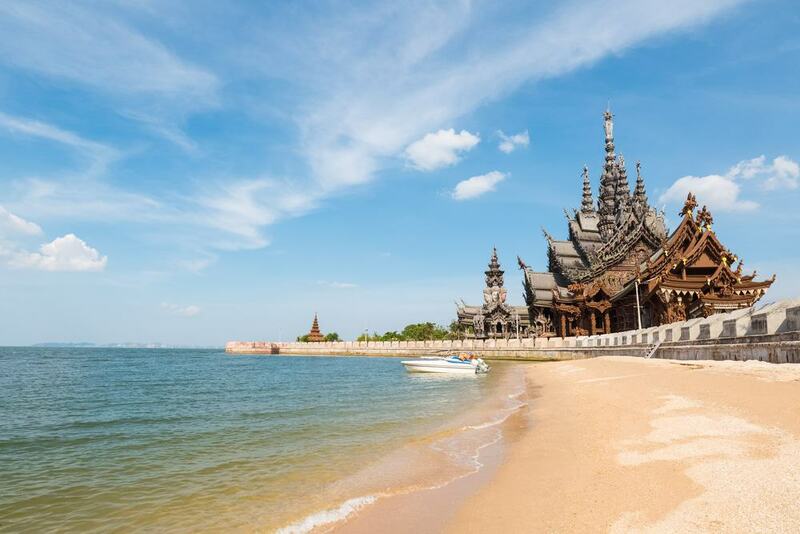 Pattaya is one of Thailand’s most popular tourist destinations, adored by international traveller and locals alike. This lively and colourful city was once a small, humble fishing village. Now the streets are adorned with high rising hotel complexes, flashing neon lights and dozens of western style bars and eateries. There is still some resemblances of the Pattaya of yesteryear in the form of the Sanctuary of Truth and Wat Phra Yai Temple. The real draw to Pattaya for many is picturesque Jomtien Beach. Being one of the closest coastal areas to Bangkok, Pattaya beach is often busy but there’s always space for another sun worshipper or two. If you are seeing a relaxing and peaceful day out then a visit to the Rose Garden Thai Village is the perfect day trip for you. These immaculately manicured gardens are some of the finest you will find in all of Southeast Asia. 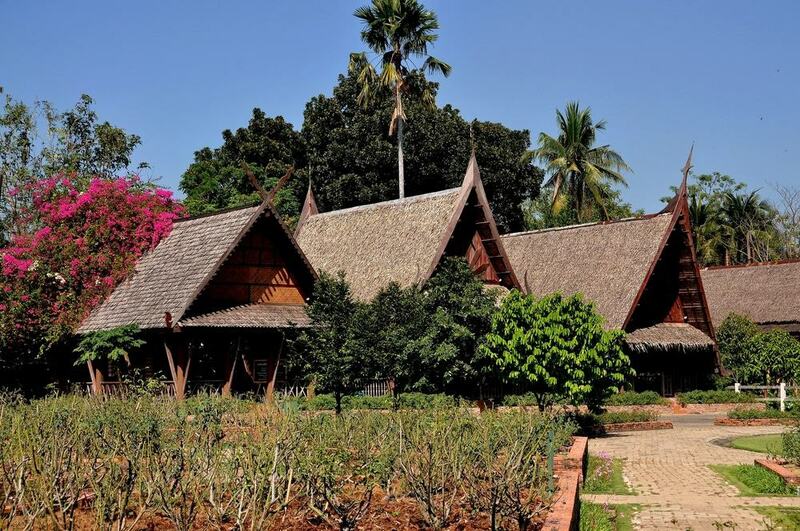 Fusing horticulture and local culture together a visit to the Rose Garden will see you enjoy rows upon rows of near perfect roses and a taste of authentic Thai culture too. Throughout the day you will have the opportunity to watch traditional Thai dance and visit traditional Thai houses too. The whole complex spans an impressive 55 acres and features its own handicraft market and local food court too. 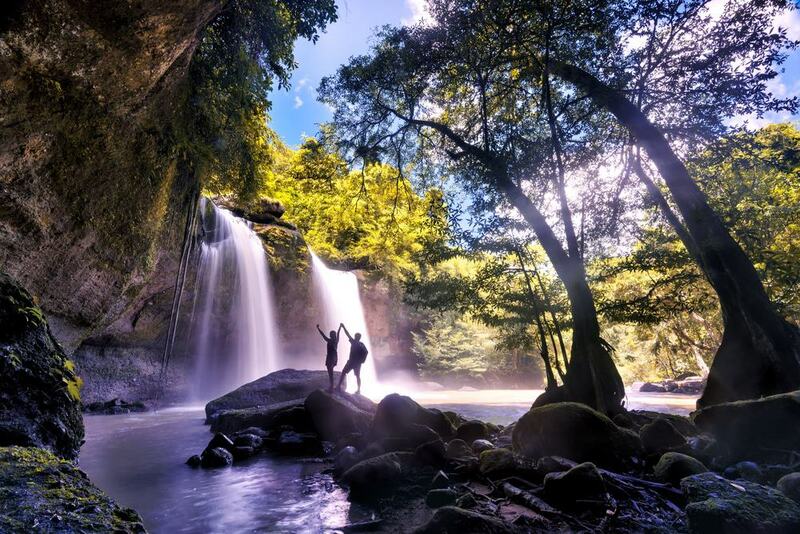 The Khao Yai National Park is one of Thailand’s national treasures. Spanning over five different protected areas the Khao Yai National Park reaches the Cambodian border. Depending on your fitness level and how active you wish to be there are a number of different options for you to enjoy. You can take a raft out on Khun Dan Prakan Chon Chan and enjoy the waterfall and man made reservoir. A popular choice is to take a hike up to Wang Ta Kari Waterfall and then again to Haew Narok Waterfall. Both of these hikes require minimal fitness level and offer spectacular views of the Thai natural forest areas. The Amphawa Floating Market is one of the most unique markets in the world. Not only a floating market but the stalls of Amphawa are situated along the tracks of a busy, working railway line. This night market is a real treat to explore, as the sun sets over the Mae Klong River you can sit back with a Chang or perhaps a Leo beer and watch the fireflies dance on the horizon. 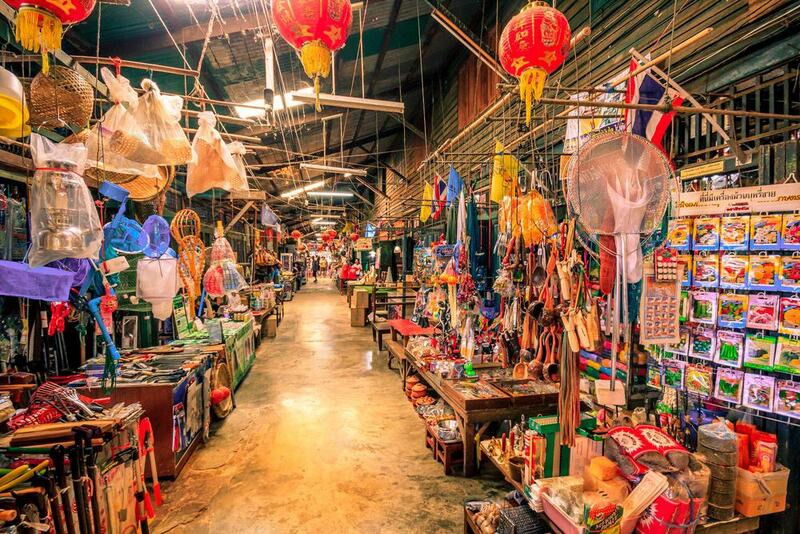 You can pick up all manner of weird and wonderful handicrafts, souvenirs and knock-off clothing, There is so much food to enjoy, from zingy papaya salad to fried mussels your taste buds will have never been treated so good. 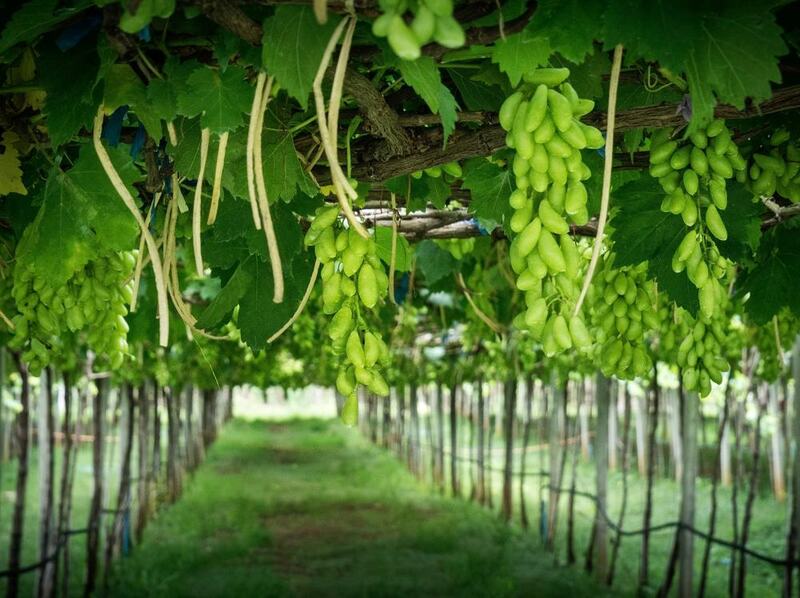 Did you know that there is a thriving wine industry in Thailand? Well, there is, on the border of Khao Yai national park. This is a really relaxing day trip that sees you hop aboard the vineyard tram and be transported through the 1000 acres of vineyards and plantations. Naturally the highlight of the day is to sample some of the amazing wines produced from the vineyards. You will have time to take a tour, on foot, of the grape vines and other fruit plantations and learn about the production process and how the land is sustainably managed. 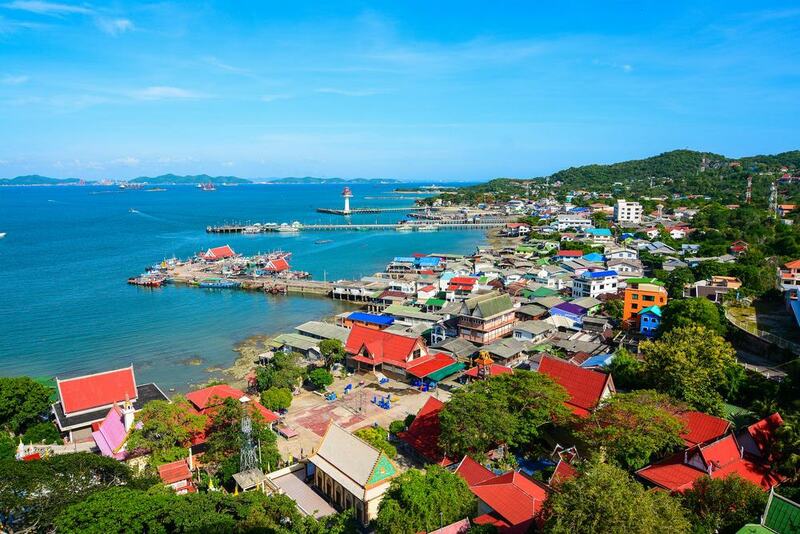 Koh Si Chang is the perfect island escape for those keen to explore Thailand’s picture perfect coastline. You can catch a ride out to Koh Loi Pier and jump aboard a local ferry that will shuttle you out to beautiful Koh Si Chang island. You can spend the day lazing on the sandy shores, soaking up the sun, or get out and about and explore. The Summer Palace is an architectural dream and was built under the reign of King Rama V. On the hillside adjacent to the Summer Palace you will find Wat Asdangkhanimitr that features the sacred Sri Maha Bodhi tree which is said to be a sapling of the Bodhi Tree in Bodh Gaya, Bihar, India. Hua Hin is a toned down version of Pattaya, for those who fancy a more low key affair. Sitting on the Gulf of Thailand Hua Hin has a wonderful beach and borders the Kaeng Krachan National Park. The Cicada Market is one of the many sprawling markets to explore and really comes alive at night. Plearnwan is a hipster, vintage-style hang out where you’ll find dozens of indie shops and family run eateries. The Mrigadayavan Palace was once the Thai royal family’s beach retreat and it is built on raised stilts that offer wonderful views of the vast garden complex below. 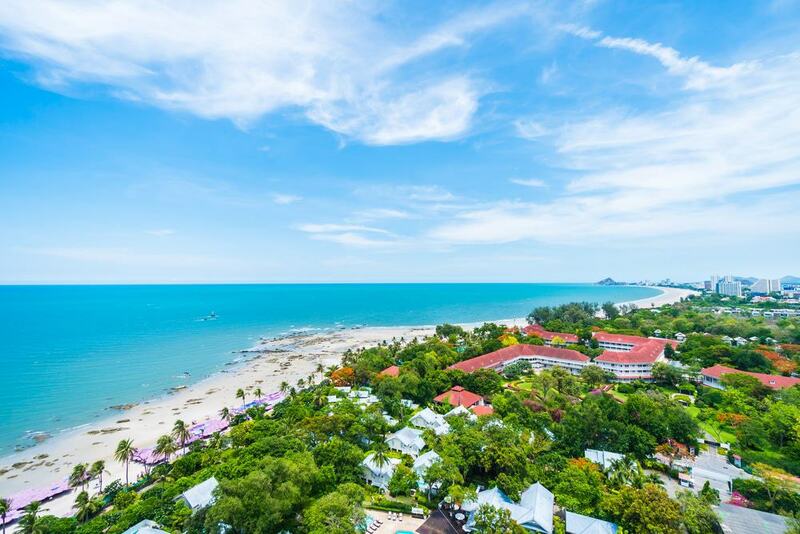 Hua Hin is a must-visit spot for kite surfers and lovers of water sports. The floating market of Talad Khlong Suan is one of the oldest markets in Thailand, for the canal itself was created over 100 years ago. 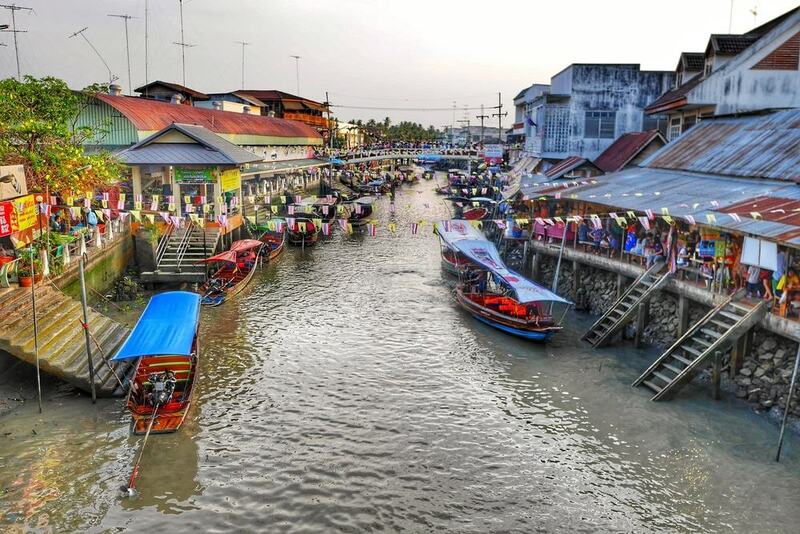 The Talad Khlong Suan market floats along the idyllic Prawet Burirom Canal in Samut Prakan Province. You can take a longboat ride through the market sampling local sweet treats and spicy surprises along the way. Talad Khlong Suan is one of the best markets to buy wooden handicrafts and as you are buying direct from the source you can be sure that both you and the local artisan are getting a fair price. Wat Saman Rattanaram is home to the largest reclining Ganesh statue in Thailand. 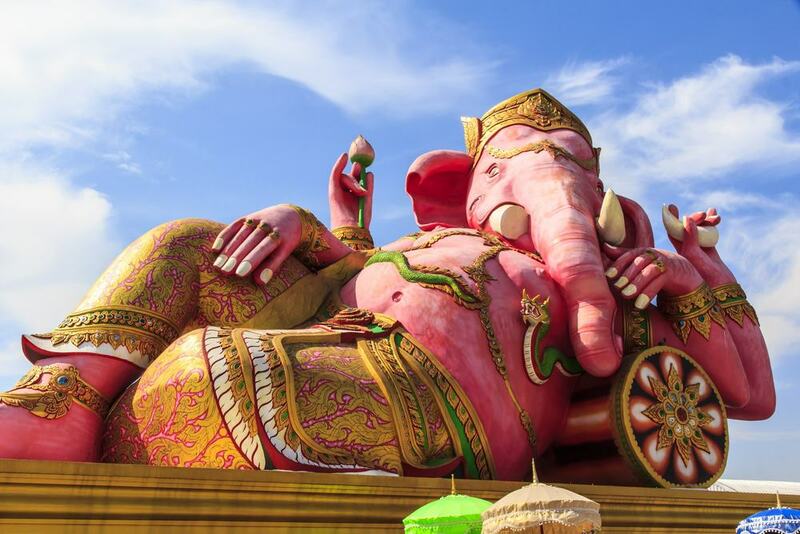 This bright pink elephant deity stands 16 m tall and 22 m in length and has to be seen to be believed. A visit to Wat Saman Rattanaram gives insights into the links and lineages between the Hindi and Buddhists faiths. Around the temple complex there are dozens of stalls selling statues of Buddhist and Hindu gods and goddesses. Remember though, it is illegal to take images and statues of the Lord Buddha out of Thailand and your purchases can be seized by Thai customs upon your departure from the country. The tiny island of Koh Kret sits at the heart of the Chao Phraya River. Best known as a settlement for the Mon people Koh Kret is an off the beaten track tourist destination that is a joy to visit. This island is famous for its terracotta which can be observed at the Kwan Aman Museum. To this day native Mon people work in their potteries along the banks of the river. 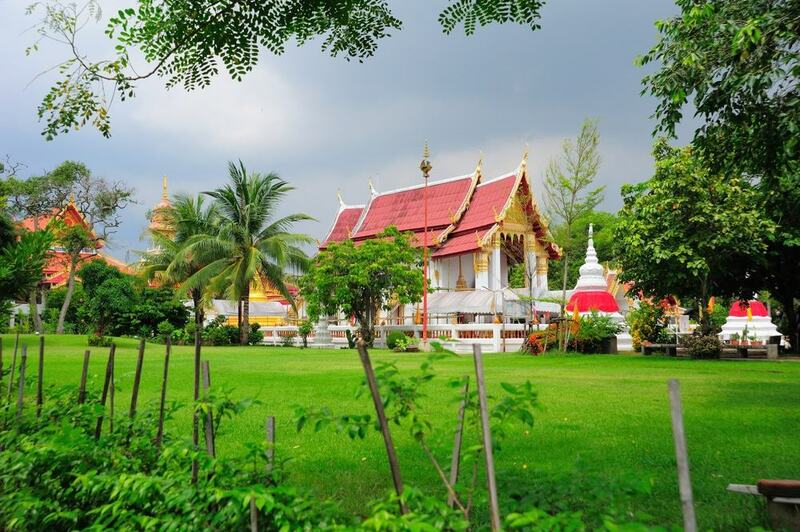 If you are interested in Buddhism and enjoy wandering through temples then be sure to head to the north of Koh Kret Island to visit Wat Poramai Yikawat. 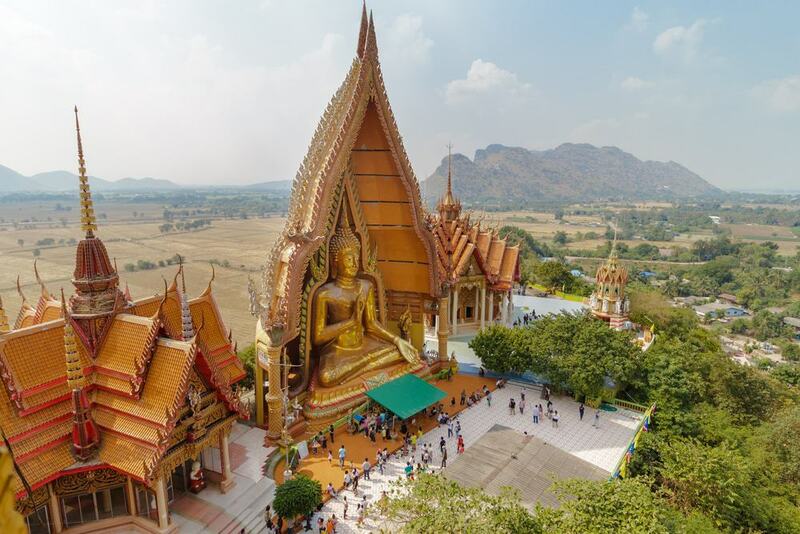 This sacred temple features an inspiring reclining Buddha and leaning stupa. 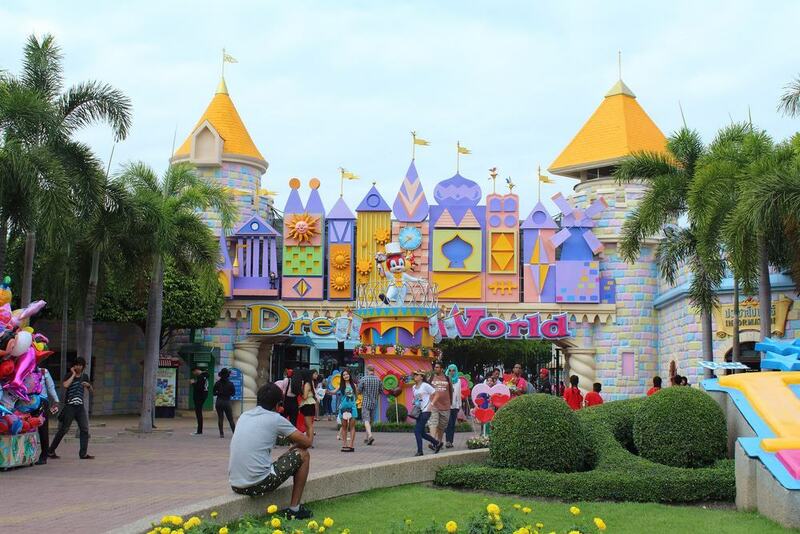 DreamWorld is Thailand’s best loved theme park and is home to over forty different rides and attractions. A whole heap of fun for all the family, DreamWorld puts a smile on the face of all who visit. The highlight of a visit to DreamWorld is an adrenaline filled ride on the Tornado. For youngsters Fantasy Land is a lovely area of the park to visit. Here you’ll find Sleeping Beauty and an interactive 4D adventure experience. Dream Garden is the best place to take a moment of rest in the heat of the day before tearing off into Snow Town and Adventure Land. 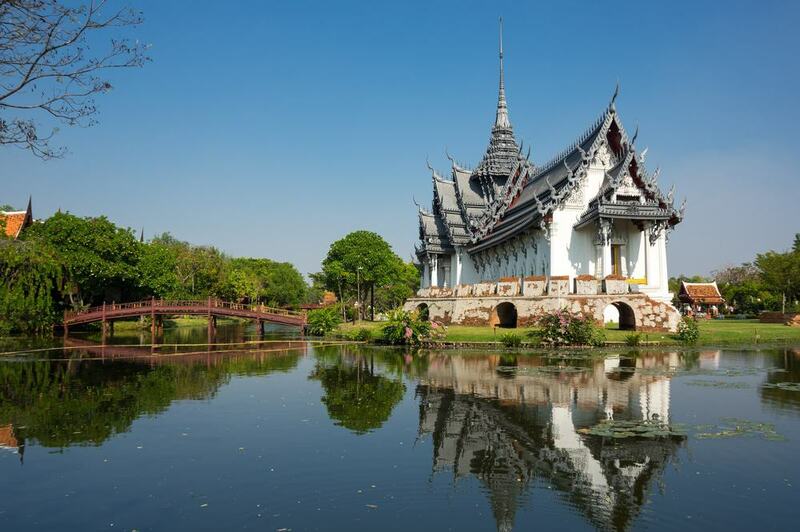 The Samut Prakan is the most centralised province in Thailand and is very easily accessible from Bangkok. The first port of call should be the breathtaking Ancient City of Mueang Boran with its amazing collection of temples and ruined palaces. The Erawan Museum features an incredible array of traditional Thai artistry, from statues to furniture and beyond. The most impressive item in the collection is the enormous three headed elephant statue. Like the reclining Ganesh at Wat Saman Rattanaram it must be seen to be believed. The King Rama IX Park is a beautifully kept garden complex featuring a man made lake with fish to feed.